In 1936, Paul Eisler invented PCBs for the first time. Since then printed circuit boards have constantly evolved, compared with earily days, they become smaller, faster and more efficient to make. Did you know that we are likely to use biodegradable printed circuit boards in the near future? In this article, some cool facts about PCB boards are shared in the following. Dark green solder mask is widely used in most printed circuit boards, but that doesn’t mean we can’t use other color. In fact, PCBs can be made of any color. There are some theories about why the iconic dark green is used in large quantities in printed circuit board manufacturing. a.This color is considered as the regulatory standard for PCBs used by the U.S. military and it transmitted to other parts of the world. b.Green could be the color of original solder mask resin, and it is used today simply on the principle of convention. c.In reality, green is mainly used for PCB manufacturing because engineers find it easier to find faults in trace lines. Printed circuit board can be found everywhere. For example, if you are reading on a tablet or a desktop computer, they are there even we usually don’t realize how ubiquitous circuit boards can be or the importance of PCBs in modern tech. When designing printed circuit boards, manufacturers often use CAD or computer-aided design tools. This allows technicians to use CAD programs, design schematics and PCB layouts to achieve during an almost seamless and accurate process. This helps to test the board before manufacturing them physically. 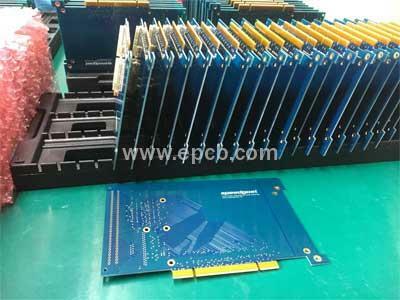 SMT is the most commonly used manufacturing technology in modern PCB manufacturing. This technique was popular since 1980s and then replaced the through-hole method (its predecessor). PCB manufactured by previous technology was time-consumed and easily caused errors is the reason why surface mount technology is so fast adopted. Electronic devices use wires as a common means of transferring energy and current. However, PCBs are an exception. Instead of using wires, printed circuit boards use copper traces to transport electrons. This makes PCB board to be smaller in size, thanks to flat traces need little space. Though PCB size is much smaller than before, the quantity of components is considerable, and all components have their own individual properties. Common used components are batteries, capacitors, diodes, fuses, inductors, potentiometers, relays, resistors, transformers, transistors.